The fetal anomaly screening programme mid-pregnancy scan (also called the 20 week scan) is offered to eligible pregnant women and carried out between 18 and 21 weeks of pregnancy. We have been working with stakeholders to update our parent information leaflets about these 11 conditions. We have incorporated the latest evidence and followed plain English principles to make sure they are clear, concise and user friendly. Today, we have published the updated information leaflet for parents about congenital heart disease (CHD). Thousands of babies every year are born in England with a heart condition. 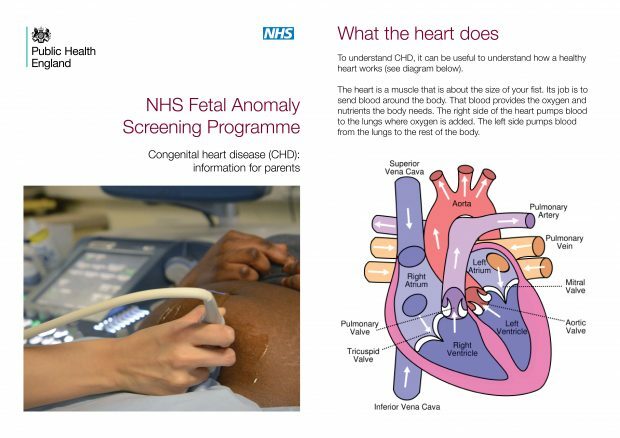 Our updated leaflet recognises that it is a worrying time for parents when they find out there may be a problem with their baby’s heart. They may want to find out as much as possible about what this means for their baby. Heart conditions vary in seriousness and need to be looked at individually. Some babies with CHD will need surgery, others will not. Less serious conditions can include narrowed valves or a hole in the baby’s heart that allows blood to flow the wrong way and mix. In more serious cases, known as ‘critical CHD’, parts of the baby’s heart can be missing or not formed very well. CHD happens in about 8 of every 1,000 births and up to a quarter of babies with CHD have critical CHD. These babies usually need surgery before their first birthday. We would particularly like to thank Tiny Tickers, a charity that supports parents and provides specialised training, education and information for professionals. Tiny Tickers kindly let us use one of their illustrations and some of their information in the leaflet. The new resource can be downloaded and printed off from GOV.UK. It is designed to support, but not replace, discussions that women and their partners have with health professionals. It also signposts parents to relevant support groups and information on NHS.UK. Please keep an eye on the blog for news of updated parent information leaflets on the other 10 conditions we screen for at the 20 week scan. Can we order copies of this leaflet? This leaflet is currently only available online to download and print off locally.